A stunning image by one of Pakistan’s foremost modern artists Ismail Gulgee led a strong selection of works by major South Asian artists at Bonhams Annual Summer Sale of Modern and Contemporary South Asian art in New Bond Street, London. The auction presented the largest group of works by Pakistani masters to ever come under the hammer at an international auction. 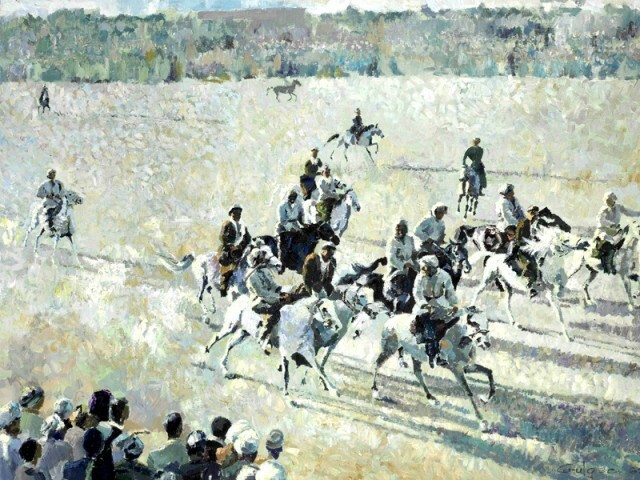 Gulgee’s 1965 work titled Buzkashi – given a reserve price of £15,000-£25,000 – which depicts Afghanistan’s national sport, was one of the highlights of this section, more than doubling its upper estimate to finally go for £61,250. The sale price is a record for an oil-on-canvas work by Pakistani artist and follows the success of previous watercolours by Gulgee that have also sold for record amounts through Bonhams.